Discussion in 'Price Drops, Must-Have Freebies, and Deals' started by Deadpool6902, Dec 23, 2015. One of the best games of 2014, grab it now . Thx for heads up, will give it a try! Earth has been destroyed by the evil Hate Bit and you are the Last Star Nerd! 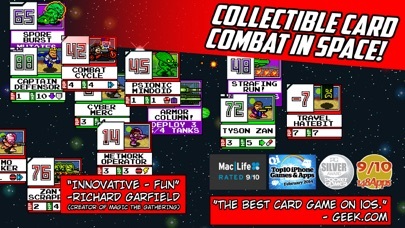 Only you can control mighty armies with Calculord Cards and battle to the edge of space! 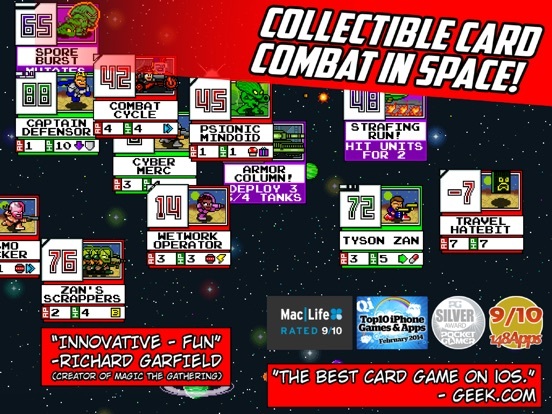 Innovative collectible card gaming combined with number puzzles and turn-based tactical combat. 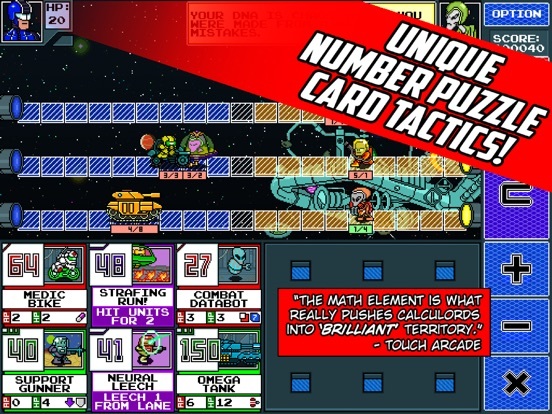 "The math element is what really pushes Calculords into 'brilliant' territory." 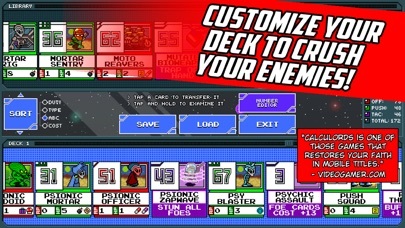 - Touch Arcade PUZZLE-DRIVEN CCG GAMEPLAY Clever use of numbers lets you deploy starships, soldiers, tanks, aliens, and devastating tactics. You'll have to be several kinds of brilliant to save what's left of space! OVER 200 UNIQUE CARDS - A COLLECTOR'S PARADISE! With every win, your card collection grows. 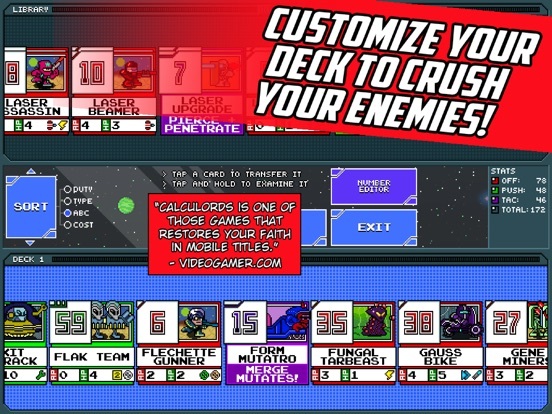 Use the robust Calculords deck editor to design up to three decks. 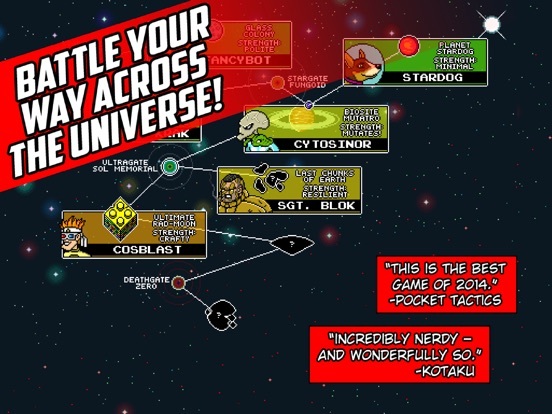 Discover your own unstoppable combos and avenge Earth! A GALAXY OF DANGER From ironclad defenses to swarms of snarling beasts, your foes will battle using all varieties of deadly tactics. Can you withstand the psionic attacks of the alien Uracillon? Can you navigate the mine fields of the trash-talking Cosblast? GROW IN POWER Defeating opponents gives you more than new cards! You also earn XP to upgrade your base, hand size, and resources. Gain massive multipliers with cunning play and get there even faster. 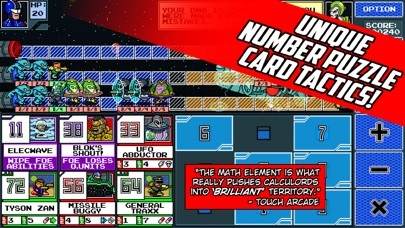 You don't need to be a genius to play Calculords, but if you happen to be one, you'll be handsomely rewarded. 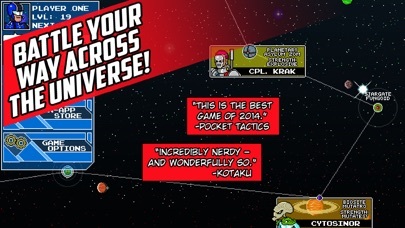 ENDLESS CHALLENGE Can you defeat the maniac Corporal Krak using only tactic cards? Can you destroy the mutate hordes of Cytosinor on the very first turn? There are 19 medals to earn against each enemy commander, and only the mightiest of Star Nerds will win them all. Are you that Star Nerd? As a teacher, I think this is the perfect game for kids to not only practice math, but it's fun too. Don't get me wrong, it's not just an educational game, it's fun all on its own. I bought this on release and liked it so much I bought all expansions/extra decks straight away... then never played it because (for me at least) the brain power requirement out weighs the fun factor unfortunately. I keep trying it periodically but almost always delete straight away again. Saying all that, I think it's about time I tried it on for size again, because I REALLY want to get into it without running into above mentioned problem.